Dead Sea salt is a mineral rich salt harvested from the Dead Sea, located between Jordan and Israel. The Dead Sea has been long been considered a natural center for wellness and health thanks to its low air pollution, temperate climate, and healing waters. The salinity of the Dead Sea is around 33% – nearly 10 times saltier than most sea water, which is only about 3.5% salt. The salt itself is unique as well. Visually, it's often off-white in color, in comparison to the bright white shade of ordinary table salt. 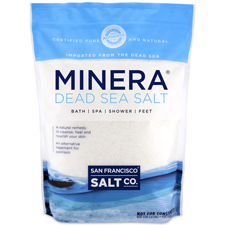 If you inadvertantly got Dead Sea Salt in your mouth while bathing you would notice the extremely bitter taste that it has – this is because Dead Sea salt has very little sodium (10%) when compared to table salt (90%). All ocean salt contains minerals, but the salt of the Dead Sea contains a much higher concentration of minerals than other sea salts - such as magnesium, zinc, potassium, calcium, bromide, and many more. These minerals are naturally occurring in the human body and are crucial to many processes, and need to be replenished regularly as they are lost. Soaking in Dead Sea salt does wonders for your skin. Rashes, sores, hives, and itching, can be treated by soaking in a warm bath filled with this therapeutic salt. Dead Sea Salt contains large amounts of magnesium and bromide, which cleanse and disinfect your skin, making you less susceptible to skin-related allergies. Dead Sea Salt can also be an effective treatment for acne, psoriasis, dermatitis, eczema, dandruff, scabies, and seborrhea. Some find Dead Sea salts can also be effective in combating hair loss, water retention, and cellulite. The benefits of Dead Sea salts don’t stop there. Stress, an ailment that affects us all at some point, can be greatly reduced if you regularly bathe in Dead Sea Salts. As your circulation improves, your heart rate decreases. The warmth of the water and the minerals in the salt work together to relax your mind and your body, from the inside out. Dead Sea Salt can also help with insomnia by making it easier to fall asleep after soaking in a Dead Sea salt bath.